Each 1.8m forked web shock absorbing lanyard comes equipped with an alloy scaffold hook, letting the user attach and detach it efficiently when necessary. It measures 1.8 metres in length, is made from resilient polyester and can boost safety in fall arrest scenarios. While our standard 1.8 metre lanyard comes with a single loop at either end, this version lets you double down on safety thanks to its forked design. Of course even with the twin scaffold hooks included, it is still made from the same reliable polyester and has an integrated shock-absorbing system which will sap the power of impacts caused by falls. The loops which keep the hooks and karabiner in place are shrouded by their own tubular webbing, which limits abrasions during use and keeps the lanyard in a good condition for longer. 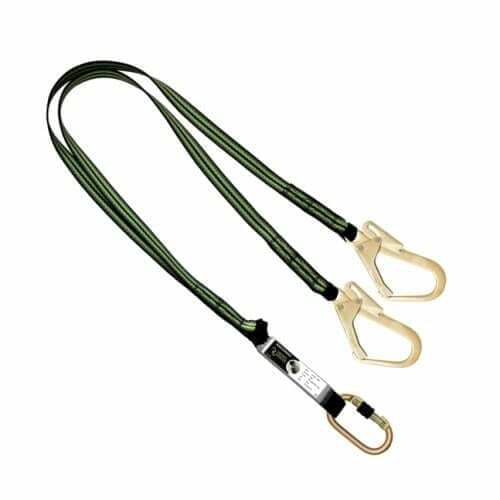 The breaking strength of this lanyard is rated at 15kN, while its shock absorbing features will soften the blow dealt by a fall to under 6kN. As well as individual lanyards, we stock complete height safety kits, including 2 point scaffold kits, 3 point restraint kits and more on our safety equipment page. Need more Information on our Lanyards? At Rope Services Direct we are here to help you, whether you have a question concerning this product or need general advice when buying height safety equipment. To talk to someone today, call 01384 78004 or head to our contact page. 1.8m Forked Web Shock Absorbing Lanyard Overall rating: 5 out of 5 based on 6 reviews.